Guest columnist Wendy Nan Rees offers her own recipes on how to make doggie bath powder and pet wipes to freshen up your canine pal between baths. They're perfect for busy dog owners who don't always have time to give their pets a full grooming. When the cold weather rolls in, the last thing many pet caregivers feel like doing is giving their dogs a bath. Still, those doggie odors persist. They come from going for walks in the rain and snow, or maybe dogs just pick up that smell from playing in the backyard. Even though it may seem futile, it's still necessary to bathe dogs during the winter months, although not quite as often as we do in the summer months. I have a great shortcut for anyone who is short on budget, time or both. I love to make my own homemade dry bath powder for those times in between full baths. Not only is it like a dry shampoo, you can also tailor the ingredients to address any skin issues your dog might have. I also love to make my own pet wipes for cleaning the paws or face when I am not giving my own dogs a full bath. The recipes in this tip can help you do the same. According to Pilchuck Veterinary Hospital, aloe vera is safe to use topically on dogs as long as you only use the gel and not the latex layer that surrounds the gel inside the leaf. For this reason, purchase bottled aloe vera from a health food store to use in this recipe. Once you have chosen the oil you would like to use, take all the wipes out of the package they came in. Place them in a large 9 x 12 inch glass baking dish, dividing them evenly into three groups. Next, combine about 15 drops of your oil with a bottle of aloe vera. Mix together well and pour the mix over the wipes. Let the wipes soak in the mix for one to two hours. Once they have been well saturated, turn the wipes over, and then let them sit one more hour. Now you are ready to put the wipes back in their plastic tub for storage. Keep the wipes in the refrigerator; this will help keep them fresh and cool to use all winter long. Use them anytime to wipe your dog's paws, face and body. Tea tree oil is used in a number of dog grooming products, but some pet owners do have concerns about toxicity. According to VCA Animal Hospitals, "Tea tree oil should only be applied diluted to the exterior body surfaces, and should never be taken orally." The following recipe dilutes the tea tree oil with other ingredients, and the bath powder is meant to be brushed back out of the dog's fur after use, which ensures it remains safe to use. Measure and sift all your ingredients together in a glass bowl. Once blended, let the mix sit for 24 hours. After 24 hours, sift the mix again, and then pour it into a shaker bottle to use as a powder container. I like to look for old glass shakers at flea markets because they work perfectly with this powder. 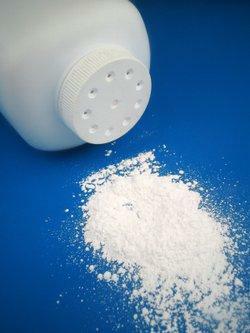 To use the powder, work it well into your dog's coat, and then brush thoroughly to remove the excess. Your pet will smell fresher, and the tea tree oil helps soothe any skin irritations your dog might have. It will also leave the coat shiny. Just take care not to get the powder in your dog's eyes or nose. Once you give these homemade grooming products a try, your pet will feel refreshed and happy that you paid him so much attention. Everybody wins!